« We are in the movies » is the title of the 16th monumental trompe-l’oeil historical mural inaugurated in Sherbrooke downtown district by MURIRS. This 16th mural brings back to life the history of Sherbrooke, that of its cinema. The location of this mural is not trivial, its stands where the popular Cinéma de Paris once stood. « I remember this grand cinema and watching a movie with my first girlfriend », laughed the Mayor at the unveiling. The technique of anamorphous used by the muralist, is better viewed from the corner of the street which gives it its 3D illusion. From there, the sign of the cinema gives the impression of coming out of the flat wall. 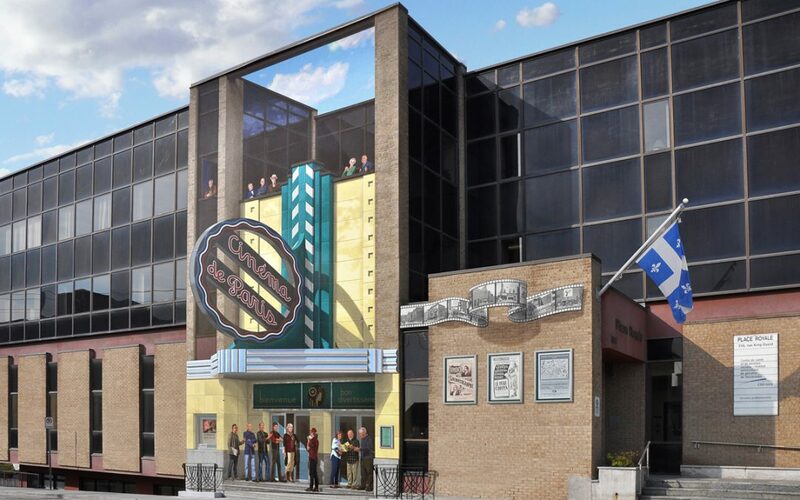 This hyper realistic mural brought pride and tender memories among Sherbrooke citizens, as they recalled watching their favorite movies from silent to the talkies. In addition to the familiar actors in front and behind the silver screen of Sherbrooke history, the visitors can gaze at the well known illustrated international faces of such characters as Mack Sennett who presented Charlie Chaplin to the world, Pauline Garon who played in more then 40 Hollywood films, and Harry Saltzman who acquired the rights to Ian Fleming’s James Bond novels. You can also find, on this life size illustration, many more details and objects about the history of Sherbrooke cinemas.